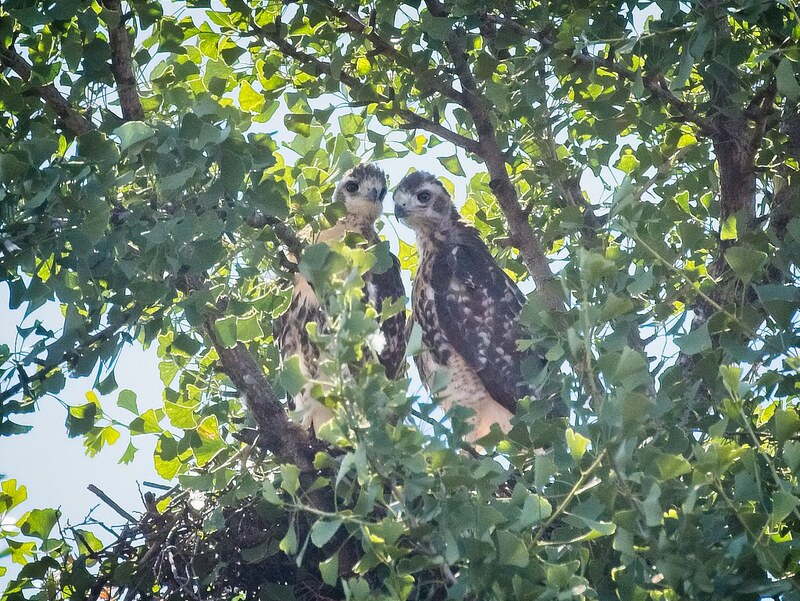 A heartbreaking update to the Tompkins Square Park red-tailed hawk who was rescued by Urban Park Rangers on July 25: WINORR reports that he passed away early this morning from the ravages of rodenticide poisoning. At 5:30 this morning I went to feed and medicate the Tompkins square park youngest only to find he had passed away between 3 am an 5:30 a.m. this is so gut wrenching. I've put all my efforts and energy into trying to fix the selfishness and ignorance of the human race. this beautiful young soul will never sore high up in the clouds bringing the caring people joy and happiness of watching his magnificence. He never got the chance to live his life. Instead he suffered a horrible death. How hard is it to clean up after yourselves and take pride in our planet and all that live in it??? The older sibling who suffered rodenticide poisoning is on the right. Secondary poisoning happens when one animal (like a rat) eats poison, then the predator who eats the prey animal dies from the poison. Our hawk likely ingested rodenticide from a poisoned rat or mouse that was brought into the park by its parents. Tompkins Square Park does not use rodenticide, but the surrounding area is full of it. I want to thank Cathy and Bobby Horvath from WINORR who did all they could to save our Tompkins Square hawk. They have rescued and rehabilitated countless birds and animals around the city and do amazing work. They do it out of the love they have for wildlife, and they do it all without funding, so please consider supporting their efforts by donating to their cause. Raptors Are The Solution (RATS) is an organization dedicated to educating people about the dangers of rodenticide and their mission is "to see all anticoagulant and other poisonous rodenticides taken off the market and no longer used by pest control companies due to their dangers to children, pets, and wildlife." I highly recommend checking out their site for alternative methods of rodent control.